Armar Ramirez to his peers, Arnaldo C. Ramirez Jr., graduated from Far Eastern University with a Bachelor of Science in Fine Arts degree, Major in Advertising. A native of City of San Pedro, Laguna, Armar Ramirez is a Multi Awarded Art director back in his ad agency days, and winner of some National painting Competitions. Armar Ramirez has a 30-year experience in Advertising, specializing on Print Ad layouts, storyboards, Designs, merchandising and collateral materials. At Present works as a Free Lance Visual Artist, specializing on Portraits, designs of some sorts. 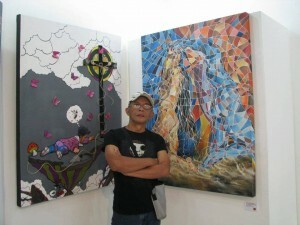 Armar RAmirez’s style in painting is semi-abstract cubismw, 3D Mixed medias on canvas and Semi Surrealism. Clients handled: Purefoods Hotdog, Dutch Boy, Amon trading, Sterling Products etc. 2015: Upcoming 2Man Show at The Address condominium, Wackwack Road, Mandaluyong City, Philippines.